Yes it’s a review blog post. It’s an unhappy review blog post. 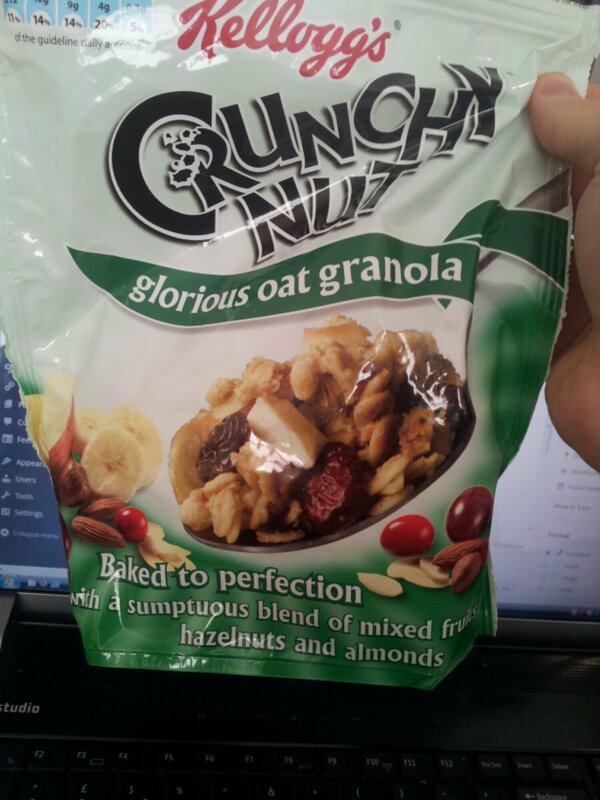 Wife purchased some Kellog’s Crunchy Nut ‘Glorious Oat Granola’ yesterday, it was on offer in Asda. “Baked to perfection, with a sumptuous blend of mixed fruits, hazelnuts and almonds” That’s what the description says on the bag. Yes it has all that, it also seems to be bulked out with what can only be described as ‘rice crispies’ I don’t remember those being part of a standard granola recipe. Of course being made by Kellogg’s it’s more sugary than usual. The packaging is misleading as well, the bag is full of mostly air, once you open it you realise it’s only half full (that’s not one of those glass half full sayings either). Packaging – Misleading, not as full as you’d think the bag is. April the eve of my unofficial marathon was the last time I blogged. I didn’t even blog to say how that went. How Rude! I’ve been toying with the idea of blogging again for a few weeks now. This morning I had an email from WordPress to tell me my year in blogging. Apparently my blogs about Kinder Egg’s and Headspace were the most viewed blogs. Suppose I should talk about goals for 2014…. Really I haven’t set any. I suppose all I’ll say is just carry on running. I’ve started a RunStreak which I’m currently on day 4. I’ll just see how long I can keep that going. I’ve also joined a group “Team Poppyfields Equator Challenge 2014” Plan is to exercise every day, and cover the 33817 miles of the equator. (This should help my run streak plans) Raising money for the Birmingham children’s Hospital Charity. The entrants are at 68 at the moment, they’re trying to get to 100 so if you fancy something different for a challenge, this is worth a look. So just a short blog, just to say hi. I’ll try to do one a week in 2014. London marathon weekend. Twitter is bustling with talk of people going nuts through tapering. On their way to collect their numbers from the expo. Arranging where to meet for a pre race pasta party. It’s all brought memories back from last year. This year I decided not to enter the London marathon thinking I’d enter another one. Start of 2013 came about and I decided I wouldn’t officially run a marathon but would instead focus on the half marathon sub 2 hour time. I offerer to help my friend though train for his London marathon place (which he’s now pulled out of because of injury). But I didn’t want to let the training go to waste, so I decided this weekend I’d run a marathon myself, around where I live. It’s an idea I’ve toyed with for awhile. There won’t be a crowd to cheer me on. No medal at the end. Just being able to do it, and for those in Boston tomorrow I’ll complete the 26.2 miles! Lastly good luck to all those running the 2013 London marathon on Sunday. Run strong, run brave, run smart. But have fun and enjoy the day! Well I said I’d try and get one post a week done. Run at the weekend went well, managed 21 miles on the Saturday in about 3 hours and 9 mins if I recall correctly. Now into tapering mode for my unofficial marathon on Saturday 20th April. Since then I’ve had a couple of shorter runs in new trainers (nike dart 9) just to keep the legs ticking over. Today I went the doctors to get a new prescription for the medication that I’m currently on as I’m now going to wean myself off it. Seems like it’s going to take about 4 weeks from what I can gather. Hopefully the headaches won’t return. Twitter is in marathon/taper meltdown at the moment, people freaking out at the slightest twinge, cough and sneeze they get. The London marathon is nearly upon us and Brighton marathon is even closer, this is what you’ve trained for people. Just remember to enjoy the race. Feel free to check out my report from last year’s London marathon. February 20th was the last time I blogged.. Why the long time since the last blog? Well I don’t know to be honest. I’ve not been busy with anything in particular. I’ve not been working extra hours. There hasn’t been any issues at home that have distracted me away from blogging. I don’t really know what It is. So really, a quick summary of what’s gone on. I’m still meditating, been doing that daily think I’m onto day 65 now of consecutive days of that, and I feel it’s still making a difference, I’m still not wearing robes round the house, but if we have a really hot summer maybe they’ll be really comfortable and ‘airy’? Running.. Yeah still running, anyone that follows me on Twitter or Strava will see the mileage I’m posting/logging, the quest for 1000 miles is going strong and tomorrow (6th of April) I’ll be going out for my 4th 20 mile run of the year. 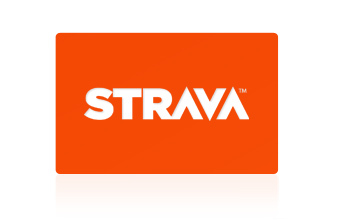 The 20th April will see me run my own marathon distance just for the fun of it, well I say just for the fun of it I got carried away when agreeing to the Strava challenges and signed up for the Marathon Challenge on their site. Headaches, Still occasionally get the odd little niggles, but nothing on the scale of what I was suffering with and nothing that causes me (at the moment) to take any time off work. So I’m hoping soon to come off the medication that I’m on, the Topirimate. I’ll have to wean myself off them which will probably take another month. Finally, weight… December 2012 saw me start this adventure, stop caffeine and stop chocolate for 30 days the Neurologist said. I did, I decided to continue that. Easter has been and gone and still no Chocolate or Caffeine. I was 15 stone 4 I’m now 12 stone 6lbs…. Thanks for taking the time to read, I promise I’ll blog again soon, at least once a week. Well I mentioned it the other day, I’ve started Meditating. Meditating has been something I’ve attempted a few times now, and failed. I’ve either struggled with the concept of ‘awareness’ and being ‘mindful’ and found myself drifting off with my thoughts. Or even falling asleep whilst sitting there! I was introduced to the Headspace App and since then haven’t looked back. It brings about a simple ‘fresh’ approach to meditating. Giving the user a free 10 day 10 minute guided meditation called “Take 10”. It’s really as simple as sitting in the chair listening to the voice and following the instructions. But it’s not just about “not thinking” and blocking out thoughts. It’s about letting the thoughts come and go so that we feel we’re not over come by them. Once I’d accepted this idea again it seemed easier. This is where I think I’d struggled in the past. I assumed that once I started meditating my mind would be tranquil, with no troubling thoughts. But that’s not the case. With this I’m allowed to approach the thoughts (which don’t seem as many now) in a calm and relaxed manner than I had in the past. They do explain the ideas behind take 10 and meditating with some really nice and simple animated videos which are available to view on the site linked below and on the app also linked below. I’ve just completed my second lot of take 10 – so that’s 20 days consecutive of actually taking 10 minutes out of the day, sitting down with no technology (aside from the podcast) and just breathing and being aware of my body. Can I notice a difference? Yes I can. There have been situations the last couple of weeks I feel which I would have reacted differently prior to this app. My wife has also noted a difference in my personality too. Am I wearing robes and sandles and chanting on a daily basis???? don’t be silly! The Headspace App is available for Android and iPhone and includes the “Take 10” meditation free. Once you’ve completed the Take 10 you can continue onto the other programs, such as “Take 15” etc for a small fee. Or just re-use Take 10 again. http://www.getsomeheadspace.com/ The Get_Headspace people are on Twitter also. This by the way is just me sharing my experience, it’s not a paid review of any sort. As this was recommended to me, I’ve recommended to my wife and a couple of other people in the hope that they’ll gain the same from it as I have.